Backflip Studios takes the addictive formula of the wildly popular Dragonvale, swaps colorful lizards for quirky machine creatures, and guarantees that I'll be obsessing over robot breeding and battling for the next year. I've written about Gizmonauts a couple of times already, back on that website that'll be returning any day now, but I've been far too busy playing the damn thing to give it the Gaming App of the Day treatment, which I suppose qualifies it for just that. Here's the Gizmonauts formula in a nutshell. Robots are split up into categories based on their functions-Performers, Workers, Construction, Repair, et cetera. Players build habitats based on these categories. They build snack shacks to make food to increase the levels of the robots in these habitats. Once the robots reach a certain level they can be bred, making new robots that combine functions. Robots generate income over time, the higher the level the more cash they bring in. Money is used to expand a player's space station, purchase new habitats and decoration, and to generate food to increase robot levels for even more income generation. What makes the game so addictive is that Backflip, as they did with Dragonvale, regularly releases limited edition robots that can only be bred during specific times. The game hasn't been out for much more than a week, and already there's been a Halloween-themed Frankenbot (which I've bred, huzzah). They've also introduced the incredibly rare Astro Bot, Gizmonauts' answer to Dragonvale's Rainbow Dragon. I shall have him, oh yes I shall. 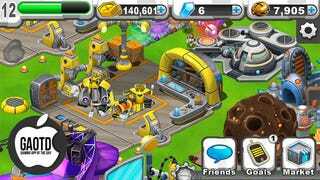 3D graphics and a battle stadium for pairing off your creations against NPC bots in battles to the death make Gizmonauts more of an evolution of the Dragonvale concept than a straight copy. Players can discover (or purchase) power-enhancing accessories for their bots, helping ensure victory in battle and the resulting income-increase that accompanies that triumph. On the plus side, my obsession with Dragonvale has waned with the release of this new game. Really I've just swapped one obsession for another. Oh well, at least I'm keeping it in the family.